This was built from a kit for around $AU120 on eBay. The kit includes the six servo motors, the brackets and the pincer. It comes with no instructions - just the low resolution image on the eBay page. It took several goes to get it right - put the bolts in on the wrong order, and it needs to be reassembled from scratch. The kit does not include a processor, but a $AU4 Arduino Nano will control it just fine, provided you get some extension cables to reach from the furthest servos. The most disappointing thing is the weakness of the motors. 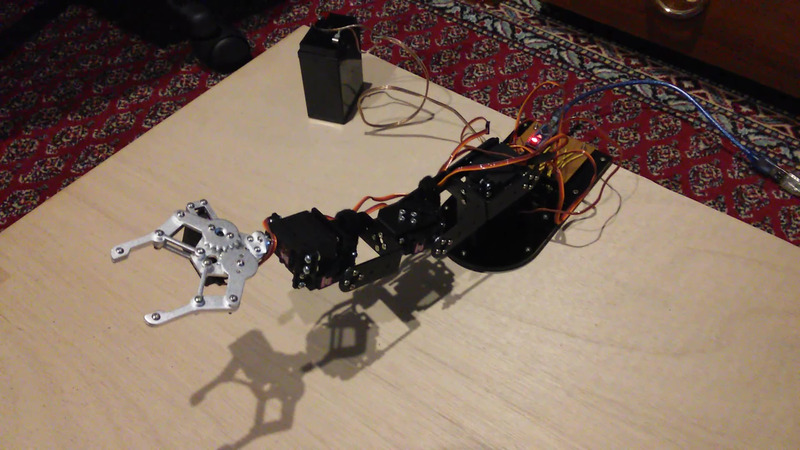 The video shows a simple program which just moves each of the servos in turn, bit it will not lift at the shoulder if the arm is fully extended (sorry for the robot anthropomorphism, but that's the easiest way to explain it). The issue too with cheap servos controlling a manipulator is the need to calibrate (and keep calibrating) the motors. Digital servos are better in so many ways, but they start at around $AU100 each. So a 6DoF manipulator would be $AU600 before the shoulder or pincer. Ouch. A very general program which allows an Arduino to be dynamically configured and then manipulated and interrogated. There is also a Java package to run on the host to manipulate this. An auto-calibrating mechanism. The initial calibration could be a manual one, and then it could be fine-tuned every use by the manipulator pressing a button, then changing the servo positions to test the limits, compared to the expected limits. Calibrating 6DoF by pressing one switch would be a challenge.